I plan to write a series on the writing process. By necessity this will be personal, detailing my own circuitous pathway leading away from scientific writing to a more popular style. I hope these posts will prove helpful for others who find in themselves a need (a compulsion?) for putting ideas down on paper. “Ink Slingers” arise! The genesis for my wanting to write lies deeply buried in the past. I doubt that it comes as a Eureka moment for others; it certainly did not for me. I recall always enjoying writing themes in school, and I soon came to appreciate a few of my efforts and those of my classmates were better written and more interesting than others. This development of a critical attitude seems to be a necessity for writing. I owe much to my H. S. English teacher who encouraged me to write. I also owe much to my mother who would have been an excellent writer had she not been such a dedicated wife and mother of four active children. These two women gave me permission (in the psychological sense) to take a few risks in my writing and try different approaches and styles. At my undergraduate school, Texas Tech University, I enjoyed honors English. The advantages were smaller class size and excellent professors. Even though I was a science major (Zoology) and science minor (Chemistry). I loved my humanities courses, especially literature. Had it not been for my all consuming desire to become a physician, I likely would have majored in one of the humanities. The posts to follow will describe the corruption of popular writing wreaked by scientific writing and furthermore how bloomin’ difficult it is to break these ingrained habits (passive voice, overly exacting verbiage, humorless and tortured phraseology, scientific jargon, and brevity to the extreme). Needless to say, once a book is conceptualized or even written, the real challenge comes in getting it published. My own experience in this journey through this forest of despair will be described- landmines, craters, heartbreak and all. And then the soaring elation of acceptance. I suppose if writing and publishing were easy, everyone would be doing it. Self-publishing nowadays does provide an outlet for everyone to publish but is this the best pathway? I hope my own effort to learn popular writing (metaphors, similes, and alliteration really are acceptable in the English language) might prove helpful. Persistence can pay off or as the mock Latin phrase says, illegitimi non carborundum (translated: don’t let the bastards grind you down). So “Ink Slingers” arise! Pick up those pens as they are said to be mightier than the sword. On moonless nights from the shadows they creep, carrying sundry items within black bags necessary for their nefarious task. Okay, okay maybe dressing up the stump is not quite that secretive or clandestine, but almost. It really is carried out in secret. 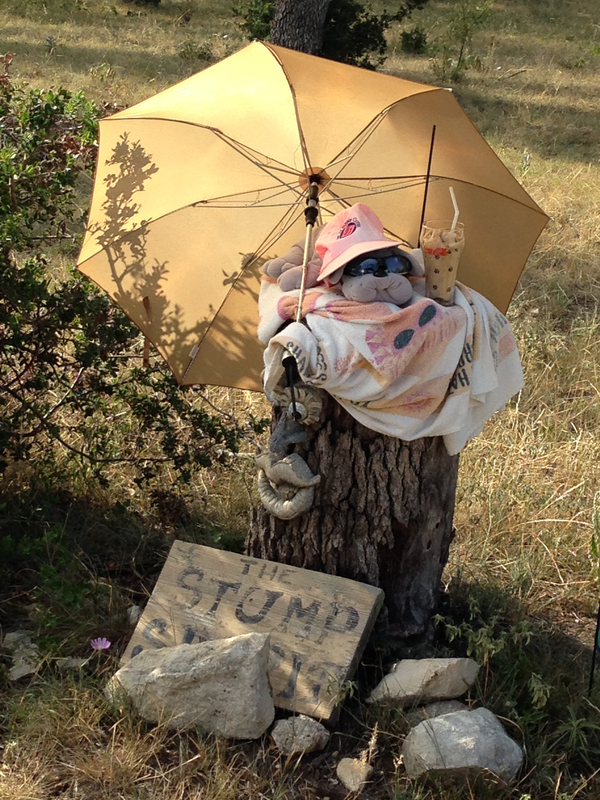 Thought you mind be interested in the legend of the “Stump Spirit” of Blue Jay Way. 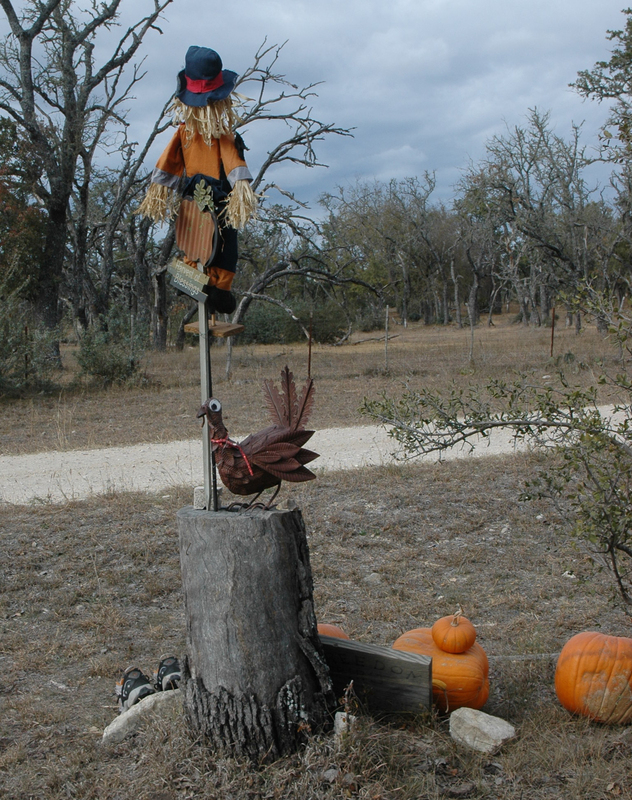 The origins for decorating the stump on Blue Jay Way, a private road serving five ranch families, began benignly enough. A neighbor boy one day left, perhaps by accident, a metal snake on the stump on the Norris property next to Blue Jay Way. Soon thereafter the snake disappeared and a pottery red bird appeared in its place no doubgt to signify the beginning of Spring. 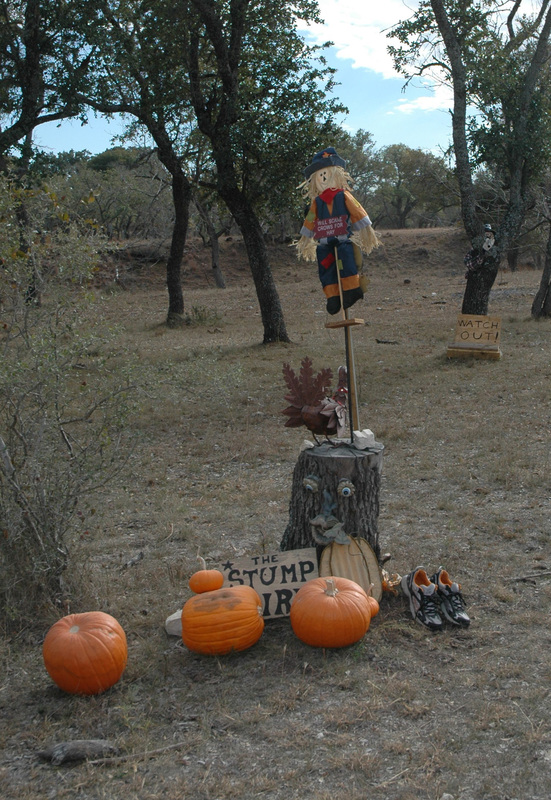 Before we knew it, prior to every holiday or season, the stump changed its appearance and the themes grew progressively more elaborate. The one on the left celebrates the laid back “dog days” of summer with a cold drink and a hound dog with a baseball cap under an umbrella. The one on the right with pumpkins and a scarecrow appeared prior to Halloween. 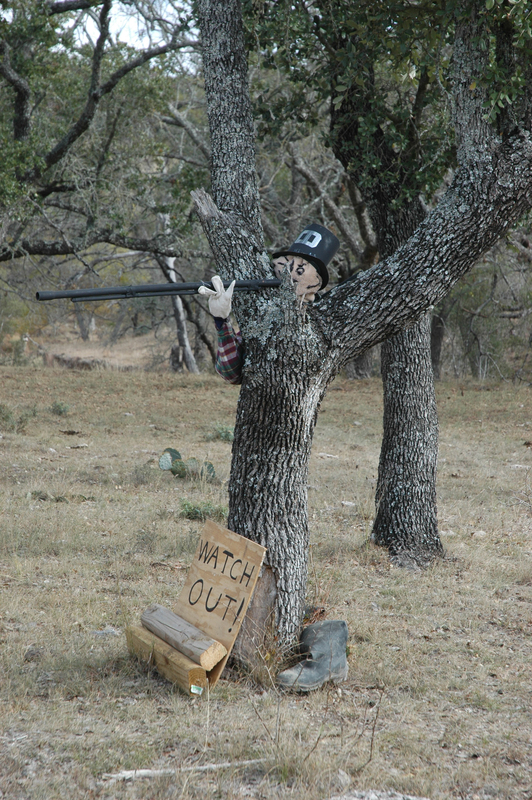 Thanksgiving gives rise to a turkey, a pilgrim, and, a hunter. Christmas is the most elaborate usually and on rare occasions, the stump has even been lit up with twinkling Christmas decorations. Now the real question to ask is why do the denizens of Blue jay Way do this? I really don’t know. Speculations run from the eccentric activities of the bored retired set, or you have to do something with all the stuff you find during Spring housecleaning, to perhaps a little bit too much of the grape! In any event, the decorating of the stump provides a collective activity for our small ranch neighborhood that brings us closer together. It has even led to a semi-annual “Stumpfest” where we gather together for bonding, food, beverage, and music. What a way to get to know your neighbors. I have even suggested we don bedsheets and show up like druids on the summer and winter solstices. Needless to say, my wife, the eminent duck wrangler, shot this one down in a hurry. Oh well, not all my ideas are keepers. So there it is, the Stump Spirit of Blue Jay Way. It is kind of fun and gets you out of the house on those moonless nights.